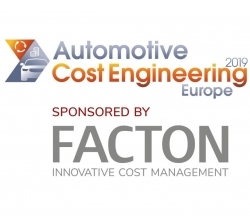 Potsdam, Germany, March 20, 2019 --(PR.com)-- Following its successful launch in Detroit, USA in 2017 and Munich, Germany in 2018, the “Automotive Cost Engineering” conference will continue with its successful format in Europe on May 21 and 22, 2019 at the Grand Westin Hotel in Frankfurt. FACTON is the main sponsor of the conference series. The event brings together cost experts from the entire automotive supply chain to share best practices and promote a culture of transparency between suppliers and customers. FACTON is making its contribution by organizing the get-together that will be held on the first evening of the event. Participants are encouraged to share their experience and network in a casual atmosphere.